Never before has food & drink industry been under such a spotlight. Consumers and business owners are conscious to the pressing issues facing our planet and are looking for ways to minimise negative impacts. Environmental concerns, from deforestation to the need for reliable sustainable and modern energy, fill increasingly more column inches and continue to place pressure on corporations to act responsibly. Then there’s the humanitarian aspect: child labour, gender inequality and extreme poverty continue to plague specific sectors of food and drink, particularly commodities like tea, coffee and cocoa. This guide looks at the imperative issues facing the planet and the food and drink industry as defined by the UN’s Sustainable Development Goals. Using data from Lumina Intelligence Sustainability, we will see on which goals the food and drink private sector is focused, as well as the players pulling their weight. 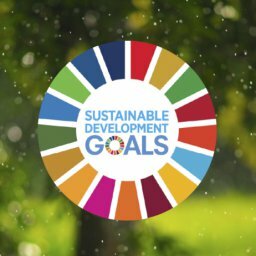 What are the UN’s Sustainable Development Goals (SDGs)? In 2015, The United Nations Assembly set 17 global goals for the year 2030 – with the objective of creating a better world for the planet and its inhabitants. The interconnecting goals cover environmental, economic and humanitarian issues and their joint achievement by 2030. These replace the eight Millennium Development Goals (MDGs) and coincide with the Paris Agreement, reached in 2015 at the COP21 Paris Climate Change Conference. If current growth trends persist, global warming is likely to reach 1.5°C between 2030 and 2052. Since 1993, the Earth’s mean sea level has been rising 3.2mm a year. If the world’s population climbs above 9.5bn in 2050 and lifestyles are not altered, the natural resources needed to supply humanity will equate to almost three planet earths. Target 1.1: By 2030, eradicate extreme poverty (Proportion living below national and international poverty line ($1.90 a day)). Target 2.1-2.2: End hunger and malnutrition by 2030 – Prevalence of undernourishment, food insecurity and malnutrition. 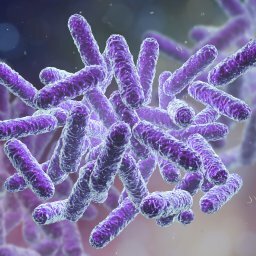 Target 3.4: Reduce by one-third mortality from non-communicable diseases through prevention and treatment by 2030. Ensuring healthy lives and promoting well-being. Target 4.1: Ensure that all girls and boys complete free, equitable and quality primary and secondary education by 2030. Target 6.1: Achieve universal and equitable access to safe and affordable drinking water for all by 2030 – proportion of population using safely managed drinking water services. Target 7.2: Increase substantially the share of renewable energy in the energy mix by 2030 – Renewable energy share in the total final energy consumption. Target 8.5: By 2030, achieve full and productive employment and decent work for all women and men, including for young people and persons with disabilities, and equal pay for work of equal value. Target 10.3: Ensure equal opportunity and reduce inequalities of outcome, including by eliminating discriminatory laws, policies and practices and promoting appropriate legislation, policies and action in this regard. Target 11.6: By 2030, reduce the adverse per capita environmental impact of cities, including by paying special attention to air quality and municipal and other waste management. Target 12.2: By 2030, achieve the sustainable management and efficient use of natural resources. Target 13.1: Strengthen resilience and adaptive capacity to climate-related hazards and natural disasters in all countries. Target 14.1: By 2025, prevent and significantly reduce marine pollution of all kinds, in particular from land-based activities, including marine debris and nutrient pollution. Target 15.2: By 2020, promote the implementation of sustainable management of all types of forests, halt deforestation, restore degraded forests and substantially increase afforestation and reforestation globally. Target 16.1: Significantly reduce all forms of violence and related death rates everywhere. Target 17.3: Mobilize additional financial resources for developing countries from multiple sources. Lumina Intelligence captured 905 pledges in Q4 2018 from the largest players in food and drink, including 22 manufacturers such as Nestle, three suppliers including Cargill, three food service operators such as Starbucks and six retailers such as Walmart and Amazon. Failure to address all SDGs could have dire consequences for the supply chain of particular commodities, Lumina Intelligence’s Sustainability Market Analyst Oliver Nieburg explains. “Some SDGs and the related key target indicators are going under the radar. Goal 1: No Poverty influences adverse effects such as deforestation, child labour, ill health and malnutrition, but makes up just 2% of industry pledges (13th most committed against SDG). Who is pulling their weight? 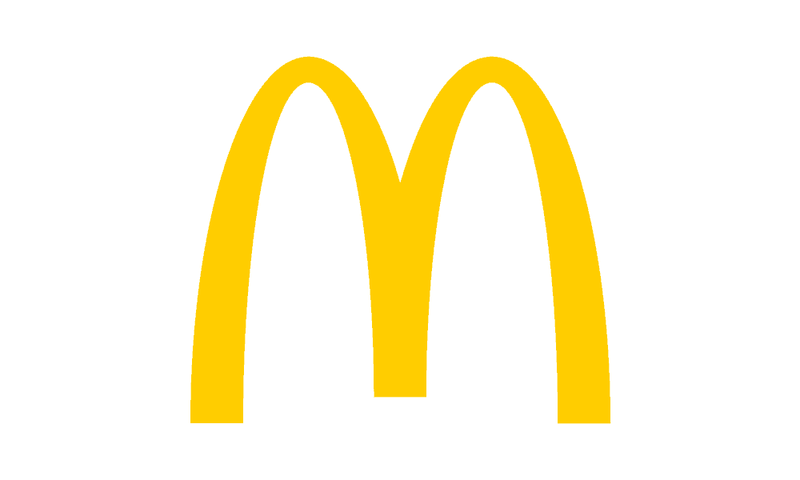 Goal 12 (Responsible consumption and production) is the top goal for the food and drink industry. 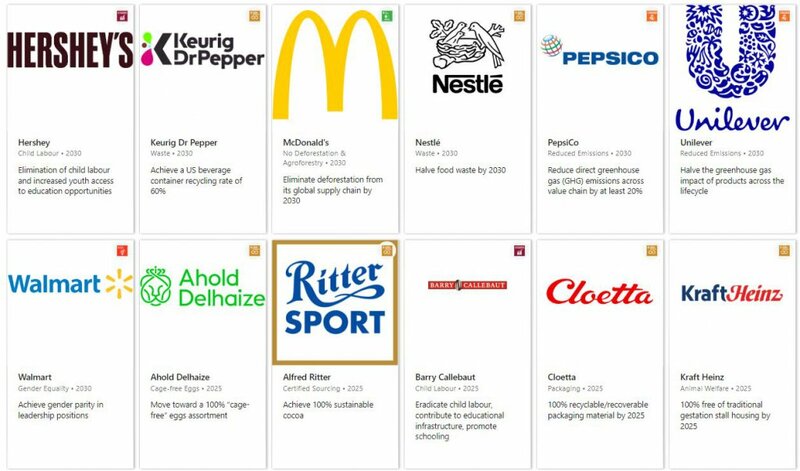 Half of Goal 12 pledges address commodity sourcing through certification – such as Fairtrade or Rainforest Alliance – or own-company programmes (for example the Nestlé Cocoa Plan and Mondelēz’s Cocoa Life). But the focus of commitments differs by company (see below). As these companies deal with different products at varying stages of the supply chain this is to be expected but could also hint that industry efforts are not fully aligned. Lumina Intelligence assigned each of the 905 industry commitments tracked to one of 29 bespoke issues, which helps shed further light on the focus areas for industry. Only a small number of commitments pertain to ‘poverty reduction’ (1.3%). As part of its research Lumina Intelligence Sustainability tracked issues pertaining to these three commodities, which face similar social and environmental concerns. At least $2bn committed by the food and drink industry towards cocoa sustainability up to 2030. These initiatives are set to reach 1.9m farmers – there are presently around five million smallholder cocoa farmers worldwide. Cocoa prices are highly volatile and extreme poverty, unlawful child labour and deforestation is rife in the sector. $1.2bn in investment from the food and drink industry towards coffee sustainability up to 2025. Aimed at reaching 803,000 farmers – around 25m smallholder farmers produce the world’s coffee. Extreme poverty and gender inequality are key issues in this sector, increasing demand could also make coffee a future driver of deforestation. The food and drink industry is committed to reaching 555,000 farmers through tea-related CSR initiatives up to 2025, according to Lumina’s analysis. Companies analysed do not cite the monetary value of these efforts. Tea is grown by 7m smallholder tea farmers in Asia and Africa. Five companies (Nestlé, Tesco, Twinings, Unilever and Tata Global Beverages) monitored by Lumina have committed to address human rights issues, including protection of children, in the tea industry. 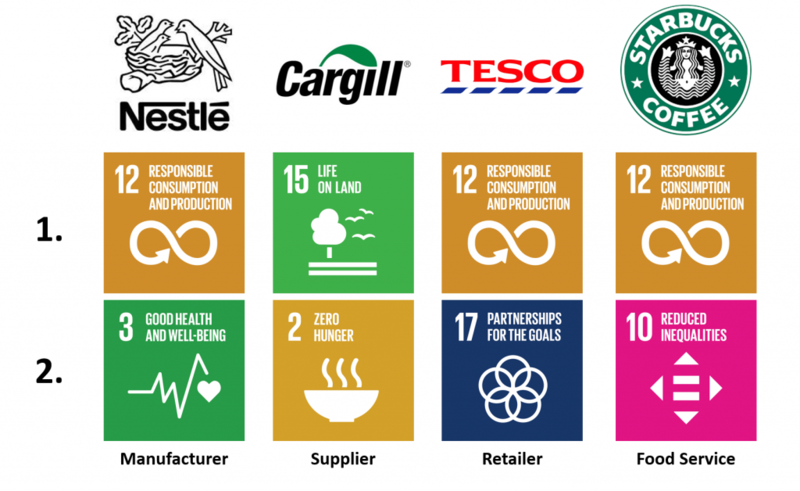 Since the United Nations Sustainable Development Goals replaced the MDGs in 2015, many companies – and in particular larger global corporations – have sought to address the goals with meaningful sustainability pledges. However, whether many of these pledges will be met by their allocated deadline, or even whether they will be effective in addressing issues, is yet to be seen. The ‘Food & Drink Sustainability 2019 – Global Progress Report’ captures how the food & drink industry is responding to some of the most pressing issues facing the planet. 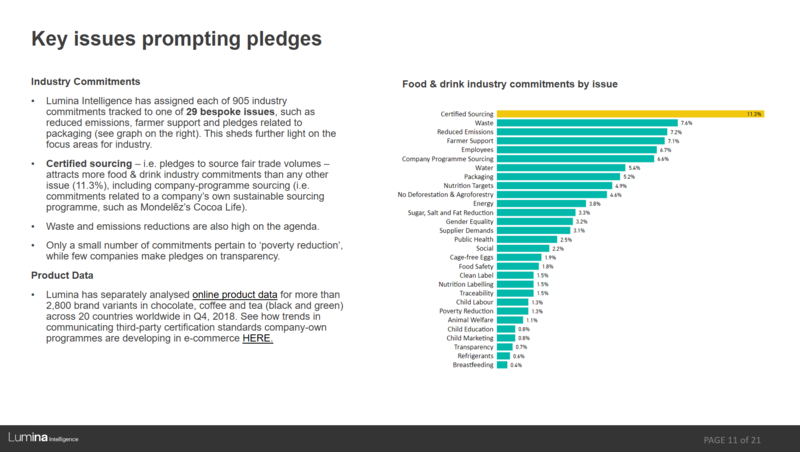 Lumina Intelligence has analysed more than 900 commitments made by some of the largest players in food & drink through corporate social responsibility (CSR) reports and media releases. This report reviews how aligned industry pledges are to the UN’s Sustainable Development Goals. 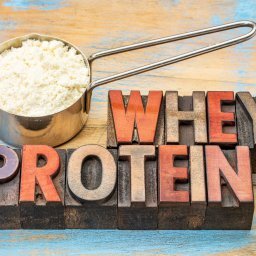 The analysis features pledges by manufacturers such as Nestlé, suppliers such as Cargill, food service operators like Starbucks and retailers such as Walmart and Amazon. The subscription service supports companies, suppliers, NGOs, governments and academics looking to strengthen their programmes, target research efforts and gauge demand for ethical products among online consumers.